Whoever has recognized the villainy of the present conditions, is in duty bound to raise his voice, in order to expose them, and thereby open the eyes of the people. ... Whoever thus uses speech will be accused of inciting disturbance by the governing rabble; he will be bitterly hated and persecuted. This shows that the only possible and practical enlightenment must be of an inciting nature. Then let us incite! A superabundance of actual wealth in the hands of the few must create hunger, typhus, and other epidemics among the many. The injustice - yea the idiocy - of this state of affairs is evident. The money-bags of course merely shrug their shoulders. This they will continue to do until a rope well tied over their shoulders will end all further shrugging. 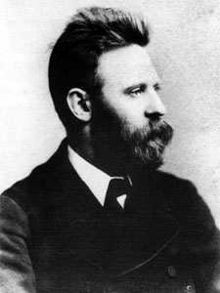 Johann Most (February 5, 1846 – March 17, 1906) was a German-American anarchist politician, newspaper editor, and orator. "Among the beasts of prey, man is certainly the worst." This expression, very commonly made nowadays, is only relatively true. Not man as such, but man in connection with wealth is a beast of prey. The richer a man, the greater his greed for more. We may call such a monster the "beast of property". It now rules the world, makes mankind miserable, and gains in cruelty and voracity with the progress of our so-called "civilization". Either by direct brute force, by cunning, or by fraud, this horde has from time to time seized the soil with all its wealth. The laws of inheritance and entail, and the changing of hands, have lent a "venerable" color to this robbery, and consequently mystified and erased the true character of such actions. For this reason, the "beast of property" is not yet fully recognized, but is, on the contrary, worshipped with a holy awe. In order to labor, there are required not only ability and will, but also room to work, tools, raw materials and means of sustenance. The poor man must, therefore, by force of necessity, apply to those who possess these things in plenty. His pretended "saviors" ... place him under the yoke of labor - they force him to the utmost of his mental and physical abilities to produce new treasures, which however he is not entitled to own. It is the lash of hunger which compels the poor man to submit. In order to live he must sell —"voluntarily" sell—himself every day and hour to the "beast of property". The times when Christian-Germanic robbers stole entire countries, deprived the inhabitants of the soil, and pressed them to feudal service, were indeed terrible enough. But the climax of infamy has been reached by our present "law and order" system, for it has defrauded more than nine-tenths of mankind of their means of existence, reduced them to dependence upon an insignificant minority, and condemned them to self-sacrifice. At the same time it has disguised this relation with all sorts of jugglery that the thralls of today - the wage slaves - but partially recognize their serfdom and outlawed position, they rather incline to ascribe it to the caprices of fortune. Though not always united among themselves - one seeking to gain advantage over the other by tricks of trade, cunning in speculation and diverse machinations of competition - yet in opposition to the proletariat they stand in one united hostile phalanx. Should the unemployed apply a little of the much vaunted self-help, that is, should he do in a small way, what the rich do daily with impunity on a grand scale, should he, in fact, steal, in order to live - the bourgeoisie will heap burning coals of "moral indignation" upon his head, and, with austere visage, hand him over relentlessly in charge of the State, that in its prisons he may be fleeced the more effectively, i.e., cheaper. When the workers combine in order to obtain better wages, shorter hours of labor, or similar advantages, the money-bags immediately decry it as "conspiracy", which must be prevented. ... When the workers organize politically, it is denounced as resistance to the "divine" order of things. Should the people finally contemplate rebellion, an unceasing howl of rage raised by the "gold tigers" will be heard throughout the world - their pant for massacres and their thirst for blood is insatiable. As the bourgeoisie, by means of its capital, completely monopolizes all new inventions, every new machine, instead of shortening the hours of labor and enhancing the prosperity and happiness of all, causes, on the contrary, dismissal from employment for some, reduction of wages for others and an increased and intensified state of misery for the entire proletariat. When increase of production is accompanied by an augmented pauperization of the masses, consumption must simultaneously decrease, stagnation and crises must ensue. A superabundance of actual wealth in the hands of the few must create hunger, typhus, and other epidemics among the many. The injustice - yea the idiocy - of this state of affairs is evident. The money-bags of course merely shrug their shoulders. This they will continue to do until a rope well tied over their shoulders will end all further shrugging. This is the lot of the poor from the cradle to the grave. Whether he produces or consumes, whether he exists or merely vegetates, he is always surrounded by ravenous vampires who thirst for his last drop of blood. The rich man never stops his work of exploiting, though he may be utterly unable to assign a reason for his greed. He that has $1,000,000 would have $10,000,000; he that has $100,000,000 would have $1,000,000,000. Under the present capitalistic system venality is an all-pervading vice. It is as a rule a mere matter of price which will buy over those who may be of service either by speech or silence, by pen or by press, by acts of violence or any other means, to the "beast of property" which by its golden dictates is the absolute, almighty divinity. In the schools strenuous attempts are made to nullify what little good the training in reading, writing, and ciphering may bring with it. Idiotic maltreatment of "history" excites that blatant prejudice which divides people, and prevents them from recognizing the fact that their oppressors have long ago leagued together against them, and that all politics, past and present, has the only object in view of firmly establishing the power of the rulers, and thereby ensuring exploitation of the poor by the rich. Whole squads of bushwackers are specially employed in mystifying the social question. The professors of political economy for instance, play the part of lackeys to the bourgeoisie, extolling the golden calf as the true sun of life, and using falsehood and knavery so "scientifically", that they make the tanning of workingmen's hides appear as a benefaction to mankind. While thus bamboozling the masses the capitalistic knights of plunder continue to perfect their mechanism of power. ... They command armies of soldiers, gendarmes, policemen, spies, judges, prison-keepers, toll-keepers, tax collectors, executors, etc. The State ... is evidently nothing more nor less than the political organization of a horde of swindlers and spoliators, who without the tyrannizing machinery could not exist for one day before the just wrath and condemnation of the oppressed and plundered people. In America the place of the monarchs is filled by the monopolists. ... All the wealth of this great republic, although established but a century, its mines, its coalfields, its oilwells, etc., etc., has been "taken" from the people and is the property of a handful of daring adventurers and cunning schemers. The "sovereignty of the people" falls prostrate into the dust before the influence of these money kings, railroad magnates, coal barons and factory lords. These fellows carry the whole Unites States in their pockets, and that which is vaunted as untrammeled legislation and free ballot is a farce, a delusion and a snare. Indeed it seems as though this young American republic had for the present but one historical mission, of demonstrating beyond controversy to the people on this side of the Atlantic as to those on the other by the presentation of bare, tangible facts what an outrageous monster the "beast of property" really is, and that neither the condition of the soil nor the vastness of domain, nor the political forms of society can ever alter the viciousness of this beast of prey. The less a necessity naturally exists for individual greed and rapacity, the more dangerous to, and obtrusive upon society it becomes. It is not voracious to satisfy its wants - it devours for the sake of devouring only! Let those who labor to live understand that this monster cannot be tamed, nor be made harmless or useful to man; let them learn to know that there is but one means of safety: unrelenting, pitiless, thorough war of extermination! Gentle overtures are for naught; scorn and derision will be the result, if by petitions, elections, and like silly attempts the proletariat hopes to command the respect of its sworn enemies. Education of the people will only then be possible, when the obstructions thereto have been removed. And that will not take place until the entire present system has been destroyed. Whoever has recognized the villainy of the present conditions, is in duty bound to raise his voice, in order to expose them, and thereby open the eyes of the people. Scientific reflections ... tear the mask of humanity from the "better class" and disclose the hideous countenance of the beast of prey. Whoever thus uses speech will be accused of inciting disturbance by the governing rabble; he will be bitterly hated and persecuted. This shows that the only possible and practical enlightenment must be of an inciting nature. Then let us incite! Let us show the people how it is swindled out of its labor force by country and city capitalists; how it is euchered out of its meagre wages by the house, store, and other lords; how priests of pulpit, press, and party seek to destroy its intellect; how a brutal police is ever ready to maltreat and tyrannize it, and with a soldiery to spill its blood. Patience, at last must forsake it! The people will rebel and crush its foes. The revolution of the proletariat - the war of the poor against the rich, is the only way from oppression to deliverance.